De Blaugies | Beer Apprentice - Craft Beer News, Reviews, Interviews and Info. Hello everyone. Sorry for not posting any reviews over the last few weeks, but I’ve been dealing with some personal issues and didn’t have much time for writing. I hope that I can get back to posting on a regular basis now. Thanks for being patient. Well, I don’t want to bother you guys with that stuff. Let’s get to the review, what do ya say? 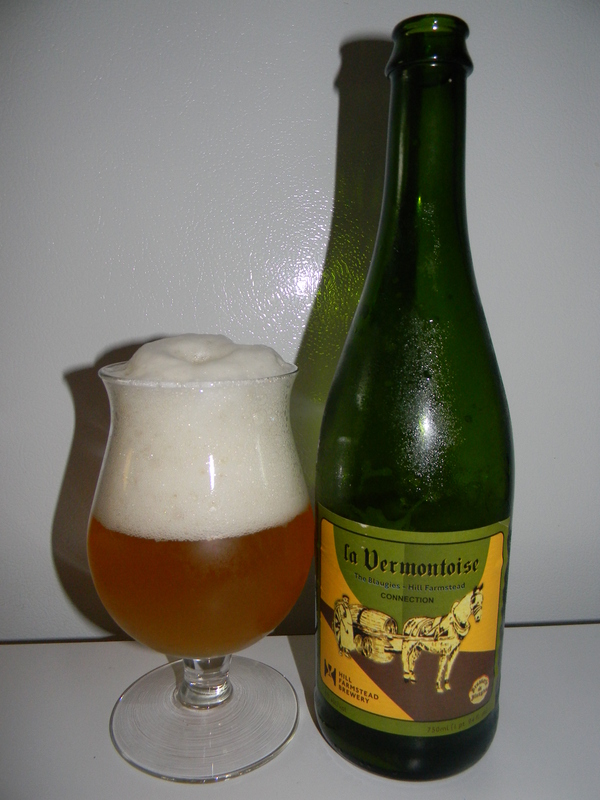 For today’s review I’m going to be trying the La Vermontoise produced in collaboration with Brasserie de Blaugies located in Blaugies, Belgium and the Hill Farmstead Brewery situated in Greensboro Bend, Vermont. I jumped on the website, brasseriedeblaugies.com, and found the commercial description of this brew. Be sure to check out hillfarmstead.com as well to read about some of their other concoctions while you’re at it. Our new beer “The Vermont” beer developed and manufactured together with our American friend Shaun Hill, whose brewery “Hillfarmstead” is located in Greensboro, Vermont, USA. We exchanged expertise on malt, spelled, American hops. Alright. I can’t wait to try this thing. This beer came in a 25.4 oz. bottle and it possessed an ABV of 6.0%. It poured a hazy, golden/yellow color with a huge, rocky, soapy and soft white head. The retention time was outstanding and the lacing was patchy, clingy and cobweb”y”. This beer looked quite nice I thought. The nose was absolutely beautiful. Tones of lemon citrus and lemongrass intermingled with hints of musty hay and slight barnyards wafts. A lot of that great Belgian yeast mixed with aromatics of spicy peppercorns. Fragrances of breads, crackers and/or wafers coalesced with floral scents toward the end to complete this complex and gorgeous bouquet. Overall, it wasn’t overly robust or loud, but it was perfectly balanced in my opinion. The flavor released a lot of that lemon citrus. It was quickly followed by some crisp crackers, fresh grasses and some splendid Belgian yeast and funk. The flavors seemed a little more forthcoming. The peppery spice was a tad bit stronger as well. The malt was somewhat sweet too. Again, very complex, splendid and world-class to my taste buds. The mouthfeel was medium bodied. Very dry, crisp, refreshing, thirst quenching and slightly bitey. The carbonation was medium strength and a touch of warmth was felt from the pepper. A great deal of flavor was left drenching the palate long after each sip. I was able to enjoy all of the characteristics for quite some time after the swallow. This was a great freaking beer!!! One of the best I’ve had in a quite some time to be honest. I should have grabbed two bottles. It’s easily one of the best Saison/Farmhouse Ales I’ve had to date. It was extremely well made, balanced and super easy to drink. It was well-defined and complex in both the aroma and the taste. I’d highly recommend that you guys try the De Blaugies/Hill Farmstead La Vermontoise if you have the opportunity. I have no doubt that you guys will love it. Especially during the warmer months and if you appreciate this kind of style. Anyway, if you do taste it be sure to leave a comment and tell me all about it. I’d love to hear your opinion.